The recent CES wasn’t only about getting eyes on the latest and greatest gadgets like the many 4K displays and all the gizmos and gadgets we shared last week, it was the perfect place for Brian White of Topeka Capital Markets to go around to check with industry sources in CES to find out when Apple will be refreshing its iPad lineup. According to rumors, Apple’s iPad lineup will be receiving a twice-a-year refresh cycle, which means that the 5th generation iPad and 2nd generation iPad mini will be due for updates this March. According to White, the full-sized iPad will be thinner and lighter than the existing one while the second-generation iPad mini is expected to keep its form factor with upgrades made to the components, such as a faster chip. 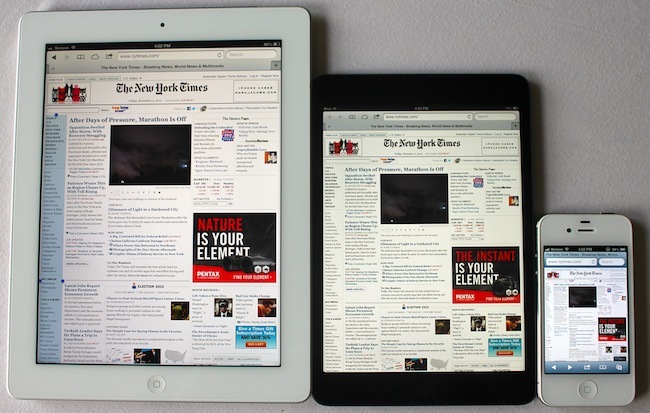 No mentions have been made as to whether the company will be using Retina display for the iPad mini or not. On other Apple rumors, it’s been said that Apple is currently testing the final beta of iOS 6.1, which would be the golden master build. This means that it shouldn’t be too long now before the OS update becomes final and be released to end users. Based on the releases that have been tested, iOS 6.1 will be compatible with iPhone 5, iPhone 4S, iPhone 4 and even iPhone 3GS; second generation iPad onwards; as well as fourth- and fifth-generation iPod touch.